Two years ago, this weekend, Don and I got to spend a glorious weekend at the Calistoga Ranch - all on someone else's dime. First of all, anytime you can go on a business trip with your spouse it's fun. 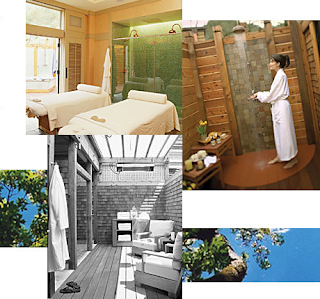 When it's a fancy schmancy resort made up of individual guest lodges, that includes cool dinners and spa treatments - - it's even better. The picture to the right is just like the "lodge" we stayed in! I seriously didn't want to leave. Don had to drag me away. This is a photo of the living room - looking out onto the deck. We don't get perks like this much anymore. Which is a MAJOR bummer. So all I have are the memories. Ah, the memories. Driving up to Calistoga in a stretch limo with my friend James, his friend and two others. Drinking wine. Stopping twice to make pit stops and buy more wine. (The journey is only about one hour.) Don was already there relaxing on the deck waiting for spazzo to arrive. We got to enjoy a delicious dinner in their cave/tasting room. Enjoyed the coolest suite of rooms which included our own private hot tub, indoor outdoor fireplace - a quaint 1200 feet of luxury. A concierge that set us up for tastings at Fleury Winery and Frank Family Vineyards, where the minute we said our name and where we were staying, we were treated like royalty. 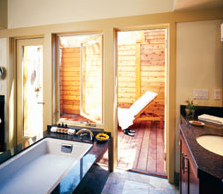 Check out the picture to the right of the tub and outdoor shower. Of course there is an indoor shower too. This was off of the master bedroom. Awesome!! Here is "The Bathhouse." aka Spa. I don't know about you, but when I think bathhouse I think girl scout camp and lots of daddy long legs - and it's nothing like this. So, Calistoga Ranch, can we please visit again? Is there a wedding or a conference we can crash? We are your biggest fans.